“We’re pissed off,” Charles said Wednesday. “That’s our thing right now. We’re pissed off right now. We’re 1-4. We’ve got a lot of fans saying this, a lot of fans saying that. And I mean, we just want to make everybody happy. We want to be happy. “I’m speaking for everyone at Georgia,” Charles said. There hasn’t been a singular fiery speech by one player, the tight end added, because everyone feels the same way. Charles said he has also detected a difference in head coach Mark Richt, who on Wednesday night had to answer a question of whether he was fighting for his job. Publicly, Richt has remained rather even-keel, but in practice it’s apparently been a different story. Richt called a full-pads practice on Monday, the first time he had done so two days after a game in his 10 years at Georgia. Charles said the players approved. So people felt like it was about time, and that it was needed? On a personal note, I really think this is gutsy as hell for Orson to say. And he should be pissed, as few times as he has been targeted this year. This is the kinda stuff that will help the team. 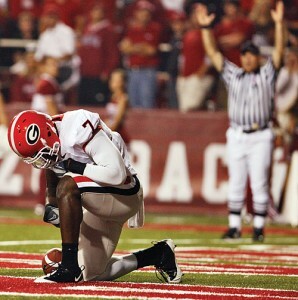 Sorry Richt, praying won’t help right the ship, God could give 3 lesser craps about if we win/lose/draw. Maybe a few cuss words in the locker room would help, too.